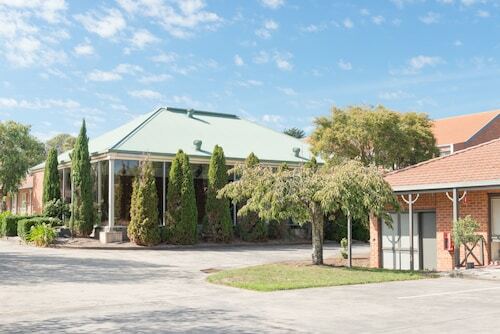 Located in the heart of Golden Point (Ballarat), this motel is within a 15-minute walk of Lake Esmond and Sovereign Hill. Gold Museum and Lake Esmond Botanical Garden are also within 15 minutes. Ballarat Station is 28 minutes by foot. 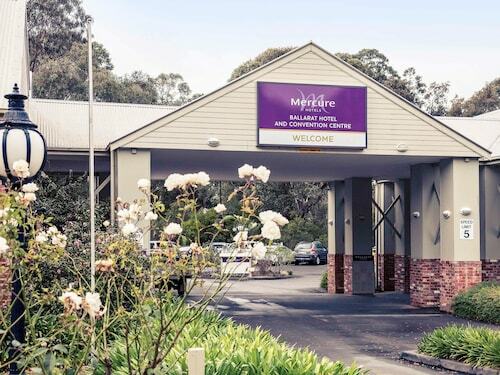 Situated in Alfredton, this motel is 0.5 mi (0.7 km) from Ballarat Golf Club and within 3 mi (5 km) of Ballarat Base Hospital and St John of God Hospital Ballarat. St Patrick's Cathedral is 3.1 mi (4.9 km) away. 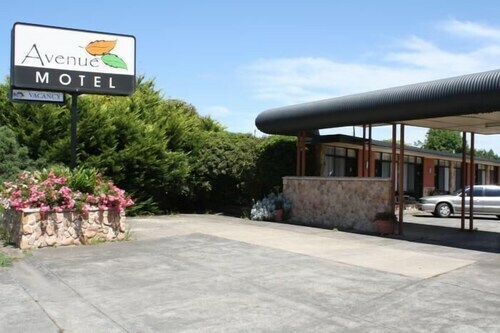 Located in the heart of Bakery Hill, this motel is within 1 mi (2 km) of Ballarat Town Hall and Sovereign Hill. Art Gallery of Ballarat and St Patrick's Cathedral are also within 1 mi (2 km). Ballarat Station is 15 minutes by foot. This family-friendly Ballarat East cabin is located in the historical district, just steps from Eureka Aquatic Center and Eureka Hall. 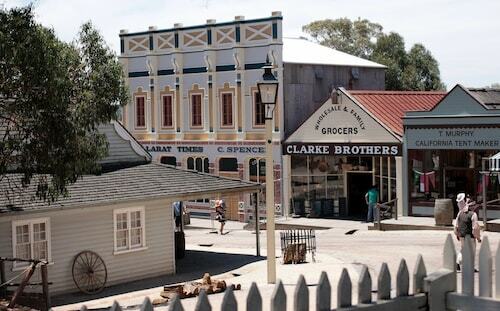 Sovereign Hill is 1.9 mi (3.1 km) away. 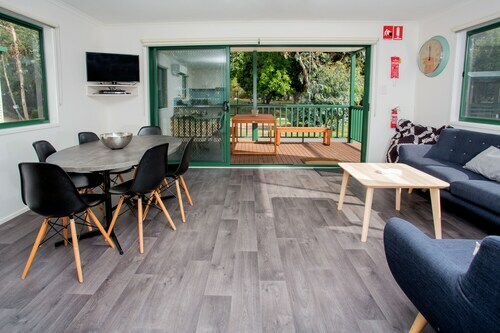 Situated in Ballarat Central, this motel is within a 15-minute walk of St John of God Hospital Ballarat and Ballarat Base Hospital. Gold Museum and Sovereign Hill are also within 2 mi (3 km). Ballarat Station is 6 minutes by foot. 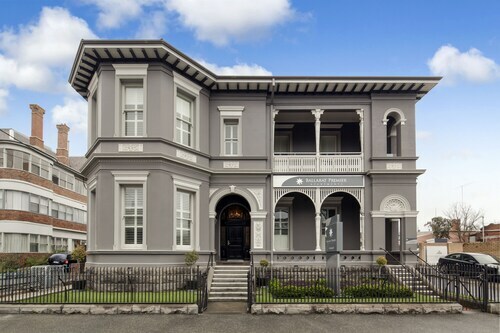 Situated in the business district, this luxury apartment building is 0.2 mi (0.3 km) from Art Gallery of Ballarat and 1.7 mi (2.7 km) from Sovereign Hill. Ballarat Town Hall and St Patrick's Cathedral are also within 15 minutes. Ballarat Station is only a 1-minute walk. Situated in Ballarat Central, this luxury apartment building is close to St Patrick's Cathedral, Sovereign Hill, and Ballarat Town Hall. Also nearby are St John of God Hospital Ballarat and Art Gallery of Ballarat. 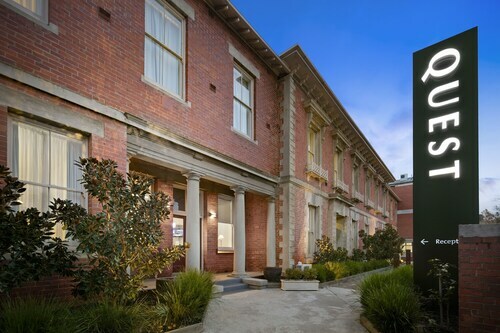 Situated in Ballarat Central, this hotel is 0.1 mi (0.1 km) from Art Gallery of Ballarat and 1.5 mi (2.4 km) from Sovereign Hill. Ballarat Town Hall and St Patrick's Cathedral are also within 10 minutes. Ballarat Station is only a 4-minute walk. Situated in Ballarat Central, this luxury hotel is 0.1 mi (0.2 km) from St Patrick's Cathedral and 1.7 mi (2.8 km) from Sovereign Hill. Ballarat Town Hall and Art Gallery of Ballarat are also within 10 minutes. Ballarat Station is 8 minutes by foot. At Ballarat you can feel the excitement of the Gold Rush or a medieval castle, wander colourful gardens and say hi to Prime Ministers (or at least statues of them), and walk down tree-lined streets filled with lavish buildings. Home to a number of unique attractions – most famously Sovereign Hill and Kryal Castle - Ballarat is a lucky find for the whole family. Experience “the Golden Days” yourself with our Ballarat accommodation and hotel deals. Ballarat’s gold mining days live on at Sovereign Hill, a whole village constructed in the style of 1850s Gold Rush Ballarat. On top of its extravagant sound and light show ‘Blood on the Southern Cross’, Sovereign Hill has a number of experiences to help you live your gold mining dreams. Pan for gold (yes, real gold! Yours to keep!) at Red Hill Gully Diggings. Explore the old-fashioned shops and buildings, and take a guided tour of a gold mine. Kryal Castle is about nine kms from Ballarat by car, but worth the trip if you like the sound of a medieval fun park filled with exciting activities. Behind these castle walls, you’ll find wizards, fairies, jousting tournaments, a dragon’s maze and the legend of Kryal itself (what’s that all about? You’ll have to go there to find out). Check out the Art Gallery of Ballarat, full of Australian art and ever-changing exhibitions. You’ll certainly want to visit the Ballarat Botanical Gardens on the shores of Lake Wendouree. With its native plants and beds of brightly coloured flowers in bloom, it’s a nice place to relax. It’s also well known for its statues, especially the collection of former Aussie PMs on the Prime Ministers Avenue. Interested in democracy? Find out all about the ordinary people who have fought for democracy and against injustice at M.A.D.E (Museum of Australian Democracy at Eureka). 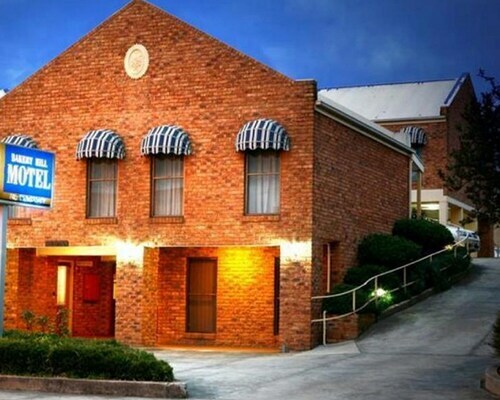 Built on the site of the Eureka Stockade, it’s full of exhibits and artifacts like the Eureka Flag from 1854. Ballarat is a roughly 90-minute drive from Melbourne. If you need to get to Melbourne first, make it happen with one of our cheap Melbourne flights. If you’re not planning to hire a car, there are trains and coach services to carry you from Melbourne to Ballarat. Hire a car or get around Ballarat on public transport. And if you need to be somewhere in a hurry and don’t want to drive, there are taxis in town as well. What are you waiting for? Book your Ballarat accommodation with Wotif today! Need insider tips on must-see attractions in Ballarat? Check out our Ballarat travel guide! How Much is a Hotel Room in Ballarat? 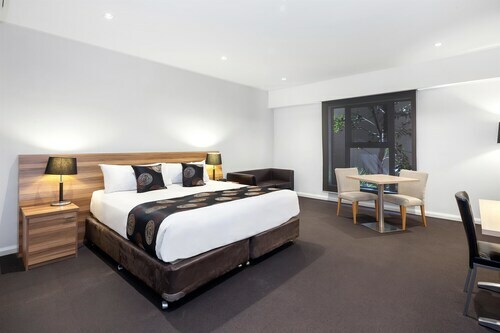 Hotels in Ballarat start at AU$90 per night. Prices and availability subject to change. Additional terms may apply. The staff were very welcoming, helpful and friendly. The location was perfect for my needs. I could walk to my appointments. The rooms are a bit dated but they are clean. Great unit but didn’t like that there wasn’t an elevator to our second floor unit. Hoped that breakfast would be included as is usual with all the other Best Western’s that we have stayed in but unfortunately it wasn’t.